i made this card quite a while ago. it's a head shot from steve's baseball photography pages photoshopped onto a 1978 topps mike garman card. not too bad, i don't think. since it's a 1978, i did a back, too. 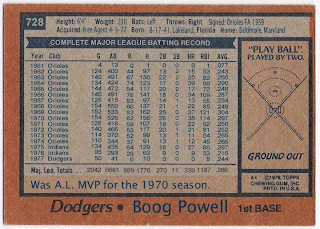 this would also be boog's 'final tribute' card, so it's nice to see the complete career totals. if you're keeping track, the 1978 set has 726 cards. card 727 is al downing and 729 is vin scully. 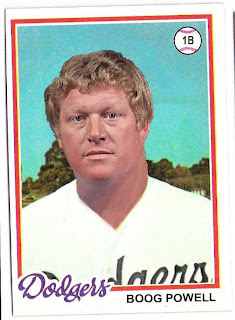 i am planning on doing a complete set of the 1977/1978 dodger players that weren't featured on an original 1978 topps card. stay tuned. doc at baseball card recollections did a 1978 boog for night owl a while back, and i used that same photo (also from steve's baseball photography pages) to create an alternate version of the one i had already completed. boog's final at bat came in pittsburgh against goose gossage. he grounded out pinch-hitting for tommy john. these days, boog runs a couple of bbq joints in maryland, including one at camden yards. 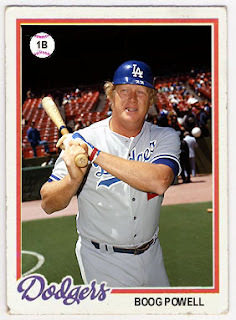 Note to Topps - We the collectors would like to see more "cards that never were" perhaps in a rebooted Fan Favorites set. 1. I grew up in Baltimore watching Brooks, Palmer, Powell et al. Boog had a magnificent swing. 2. Went to graduate school in Albuquerque when the Dukes, Dodgers' AAA team, arrived. Saw the following players in Albuquerque (these are the ones I can recall): Lopes, Garvey, Cey, Joshua, Russell, Yaeger, Hisle, Ferguson, Hough, Paciorek, Rau. Joshua was the biggest star of them all in Albuquerque. He had only a modest career in the bigs. Probably the greatest minor league team every assembled. Forgot to leave my email address for follow up. chan ho park through the mail success! leron lee through the mail success! paul molitor through the mail success! tommy lasorda ebay auto success! milton bradley through the mail success! pete rose through the mail success! and failure! the bobby cox card that should have been! don demeter through the mail success!